This blog post is one of 6 posts summarizing outcomes of the Beta City Workshop series Street Plans led as part of the Tactical Urbanist’s Guide to Materials and Design project. To learn more about the Materials Guide, click here. 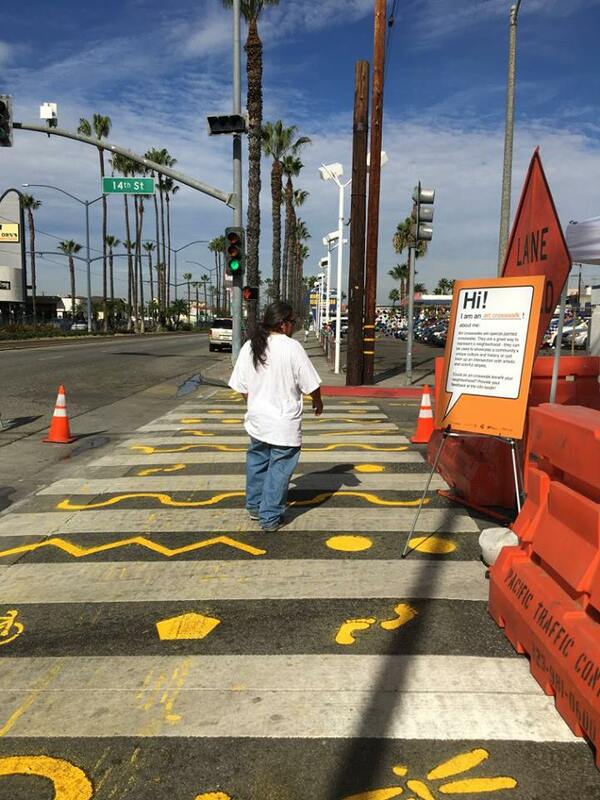 Long Beach, CA is one of six “Beta City” partners that Street Plans is working with as part of the Tactical Urbanist’s Guide to Materials and Design project. In working with Beta City partners, Street Plans will deliver a series of workshops designed to expand each City’s familiarity and comfort with planning and executing collaborative demonstration, pilot, and interim design projects. 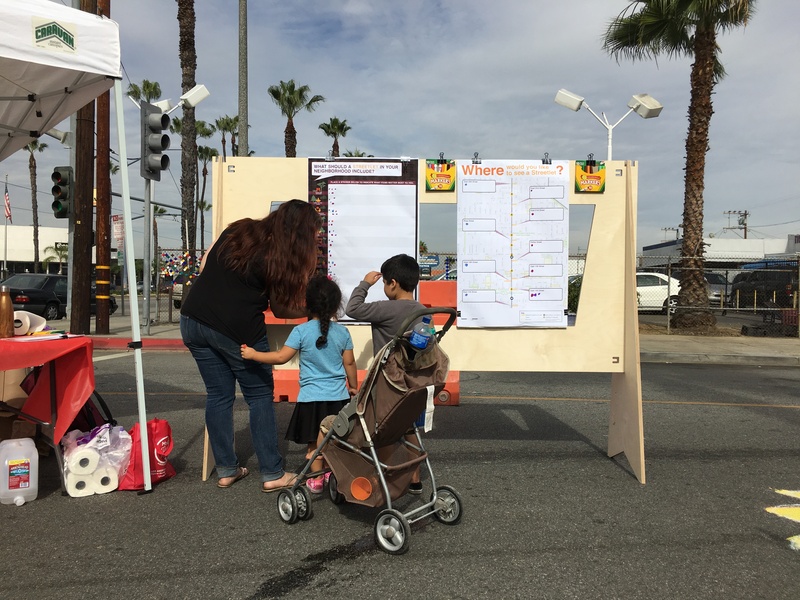 In Long Beach, Street Plans worked with Long Beach Development Services (LBDS), in partnership with City Fabrick, a non-profit design studio dedicated to transforming communities through public interest design, planning, policy development and civic engagement. 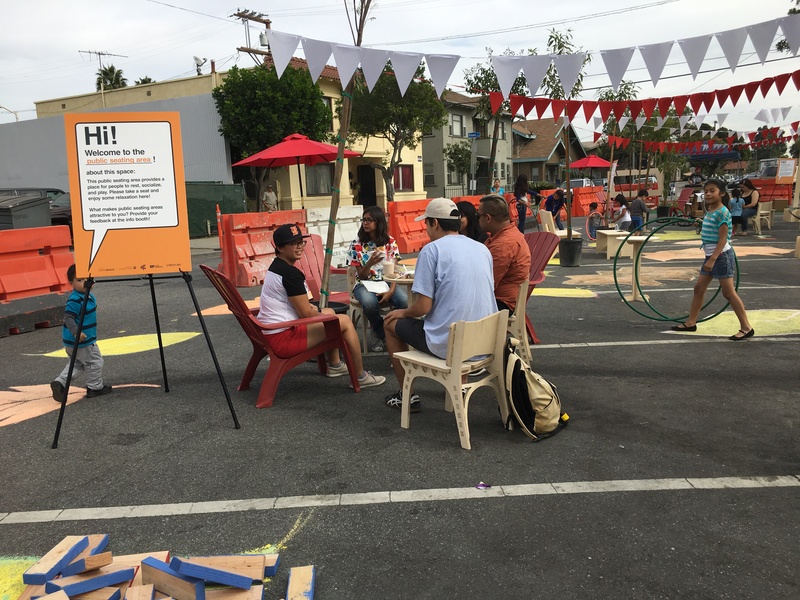 Broadening public engagement in the Streetlet planning process, by gathering input from attendees about what a more permanent/interim-design Streetlet should look like. Testing program and design elements to see what resonated with attendees, informing plans for an interim-design project. 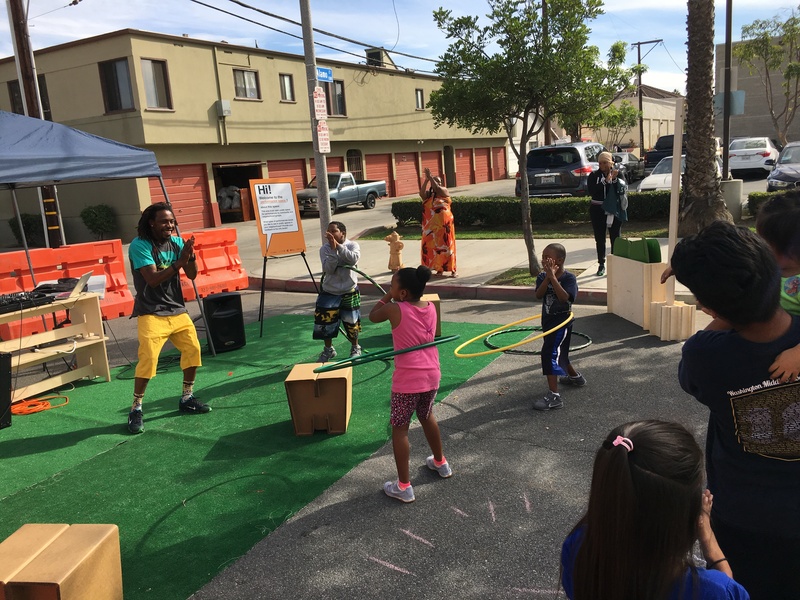 Providing a pop-up public space amenity to community members, catalyzing excitement among residents and business owners in the project area. To kick off the process, Street Plans and LBDS hosted a planning meeting to convene partner agencies and organizations, and map out an action plan for creating the one-day Streetlet demonstration. The planning meeting was attended by approximately 12 staff representing a variety of roles across City of Long Beach agencies, including Public Works and Public Health. Based on outcomes of the planning meeting, Street Plans, LBDS, and CityFabrick worked together to design and implement a 1-day Streetlet demonstration on Saturday, November 12th from 9:00am – 3:00pm.The Streetlet demonstration included street murals, plants and greenery, street furniture, public art, artistic crosswalks, opportunities for physical activity, games, bike rental, and music. Importantly, the demonstration included a number of interactive activities to gather feedback from attendees. Public engagement activities included conversations with the community, comment cards, educational signage, and idea boards. Building from the positive feedback received during the demonstration, LBDS is now moving forward with design and implementation of an interim-design Streetlet where the demonstration took place. Street Plans led a workshop with Washington D.C. on Wednesday, October 26th and was attended by approximately 25 staff representing a variety of roles across each department. As one of six “Beta City” partners associated with the Tactical Urbanist’s Guide to Materials and Design project, Street Plans led Washington D.C. in a workshop with the goal of expanding the City’s familiarity and comfort with planning and executing collaborative demonstration, pilot, and interim design projects. The workshop focus was developed collaboratively by two workshop coordinators: Dan Emerine – Senior Transportation Planner at the DC Office of Planning (OP); and Colleen Hawkinson – Manager, Strategic Planning Branch at the District Department of Transportation (DDOT). 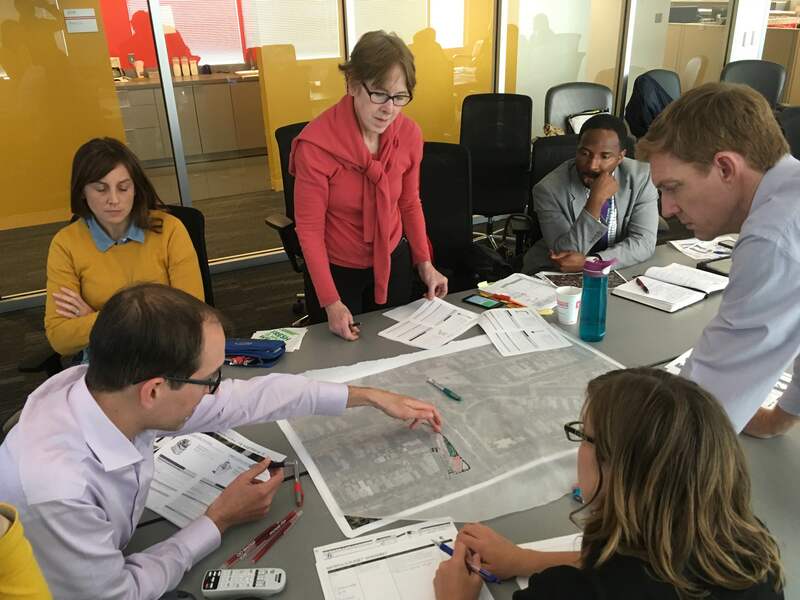 Based on each agency’s needs and priorities, OP and DDOT chose to focus the Workshop on advancing a Tactical Urbanism pilot project at the intersection of Florida Avenue NW, North Capitol Street, Q Street NE, and Lincoln Road NE. 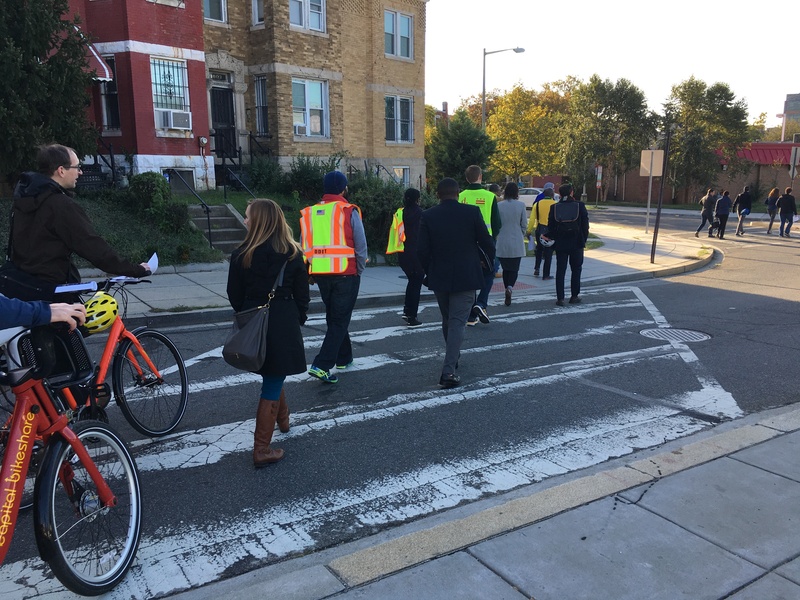 DDOT’s Mid-City East Livability Study outlined a proposal for long-term improvements at this intersection to improve safety and mobility for people walking, biking, and driving. Increase collaboration across City departments, and between City and community stakeholders. To kick off the Workshop, participants joined in a site visit to examine challenges and opportunities at the focus intersection. Following the site visit, workshop attendees reconvened in a meeting room and split into two teams to develop draft design proposals for pilot projects at the target intersection, working in groups comprised of both DDOT, OP, and Mayoral staff. Each team was provided with a packet of temporary materials which might be appropriate for the project, excerpted from the Tactical Urbanist’s Guide to Materials and Design. In addition to sketching design ideas, teams were asked to map out a rough list of materials and costs, potential partners, and an implementation timeline. At the end of approximately 90 minutes of design activities, each team shared their final ideas and work plans with the larger group. Working from each group’s ideas, attendees solidified the vision for a pilot project that could be implemented in Spring 2017. 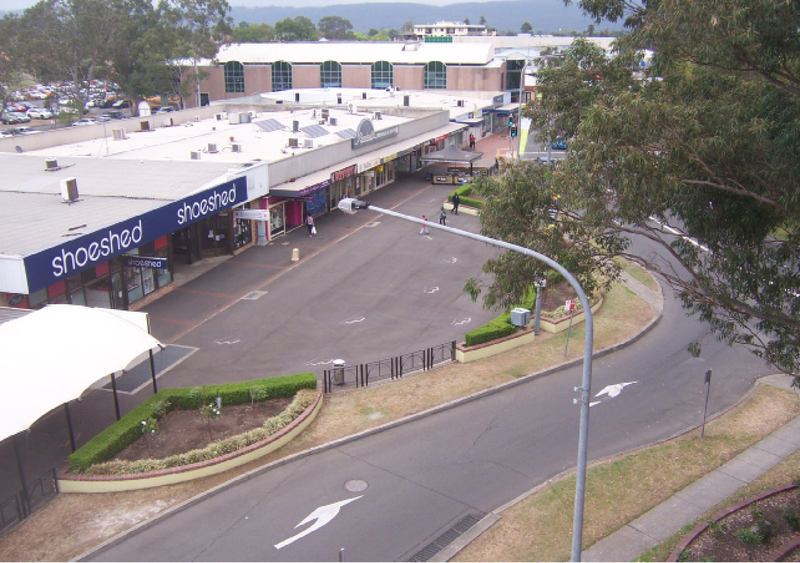 Penrith is a regional city on the edge of Metropolitan Sydney, Australia. In 2012, the city commissioned a master plan focused on revitalizing its retail core. Street Plans worked with the Sydney-based consultancy Place Partners to integrate Tactical Urbanism into the master planning implementation process. 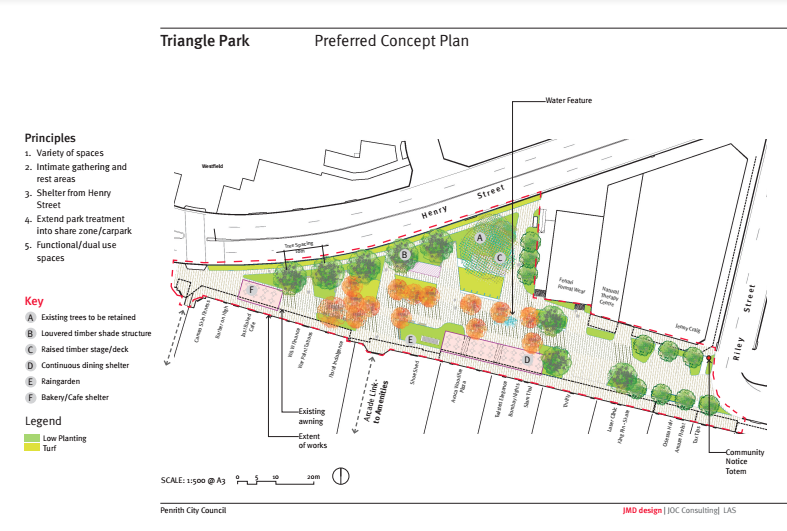 In the fall of 2013, Street Plans and Place Partners delivered a temporary public park that was in place for a one year trial period. The pilot was designed to test uses and design elements before committing to a fixed design and the associated costs. Over the course of the year, an independent consulting firm was hired to assess the park’s success. Behavior mapping, business owner engagement and traffic studies were employed as tools for learning. 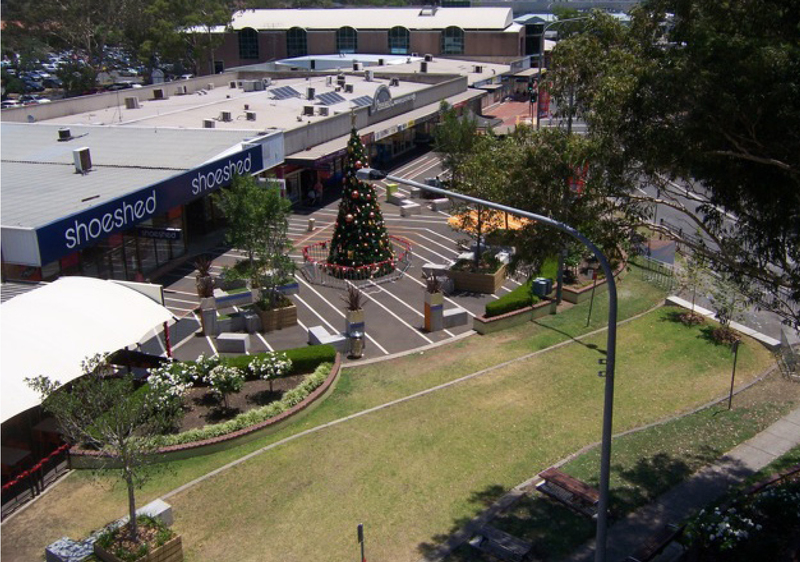 Following a successful one year pilot project, Penrith City Council decided on a final plan to not only make the park permanent, but to also maintain the interim design until construction could begin in the first half of 2017. The pictures above show the space before the project, the interim design, and the final plan for the permanent park as designed by JMD-Design. See this link for more about the project.